Its time for the next installment of the Finish the Undead Collection project. I had about 1/2 as many un-finished as I had finished, so rather than paint the new ones and put up with mixed styles, I decided to repaint all of them. The one nod I made to my original work of ~15 years ago, is the one citadel figure with the red-orange robe. I wouldn't have chosen to do it that way now, but I did it that way then, and since the vast majority of this army is not getting repainted, I told myself I had to keep that nod to that sort of old school choice I made way back when. Quite happy with this batch. 9 wraiths, and then the reaper figure with no weapons is a banshee to lead them, which I guess is the way things work now. (Also, wraiths skirmish now? Huh, ok). 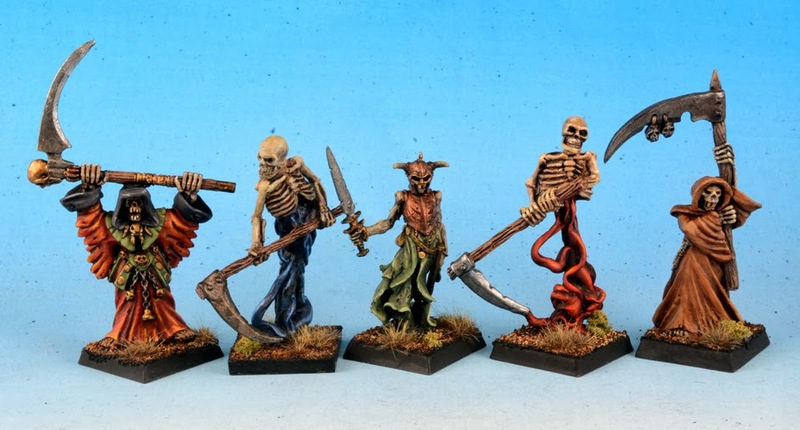 Figures are citadel, otherworld, reaper, and . . . heartbreaker maybe? I can't remember for sure who made the two in the bottom pic that are skeletons from the ribs up, atop the floaty bits. I've had them since the first time these all got painted. . . anyone know? Oh so close. The grapes of wraith are nearly ripe.